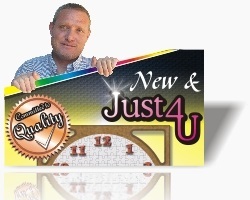 Our clock face designer is an online tool that allows our customers to design there own clock face by dragging and dropping there own image into the clock and choose what hands, numbers and frame best suits the image dropped. The designer works on your DOM which means that no data or uploading is used to display your images. Once our customer has finished designing and is happy with the final layout then they need to capture and save the layout as a jpg image file. The final layout image captured can now be emailed to us with the original image that was dropped into the designer. This very small simple utility program plays a very big role and was a lot of fun to design. Important! Open the designer from a desktop browser for best results. NOTE : No internet data is needed after the designer has loaded. You will see a block like this that will say "Drag and Drop your image into this block"
All images that get dropped into the clock will be stretched or shrunk to 620x470px and positioned in the center which is the default for all new dropped images. You will notice that the image will display immediately so you can go threw as many images you need to without using any data. Show and hide the clock by double clicking on the image inside the clock. This will allow you to move and resize the image to the position that you want. You will notice that each corners of the image has a circle, use your mouse and click and hold in the circle then move to resize or click on the image to move. Double click again to show the clock. Once you are satisfied with the positioning of your image then use the control buttons to select the best frame, hand colour and numbers that will compliment the image. Again no data will be used to change the options. When the designer is opened all the options are downloaded so you can work off line and take your time and enjoy. Once you are satisfied with your clock layout. Enter a file name you would like to save the clock layout as, then push the Done button. A capture and save button will appear. Push the button and then Capture and Save. Have Fun and enjoy. Please like or share this page or send a message. Messages sent below that are relative to the wall clock face designer and can help other users will be published with a detailed answer. Your email address will not be published. The price will be between R350 - R450. This product will only be available for purchasing early 2017. For Gmh Packaging to deliver a top quality product and quality service.